The	META function of leap™ is used to increase the Search Engine Optimization of individual pages within your website. While the Search Engine module previously described assists with this function for the entire site, and most particularly the home page, the META function helps drive web traffic to specific pages within the site. Note: This function is located in the main menu of leap™ rather than the Main Admin section. Log into the administration side of your website (see section on leaping into your website). Navigate to the page for which you want to update the META information. 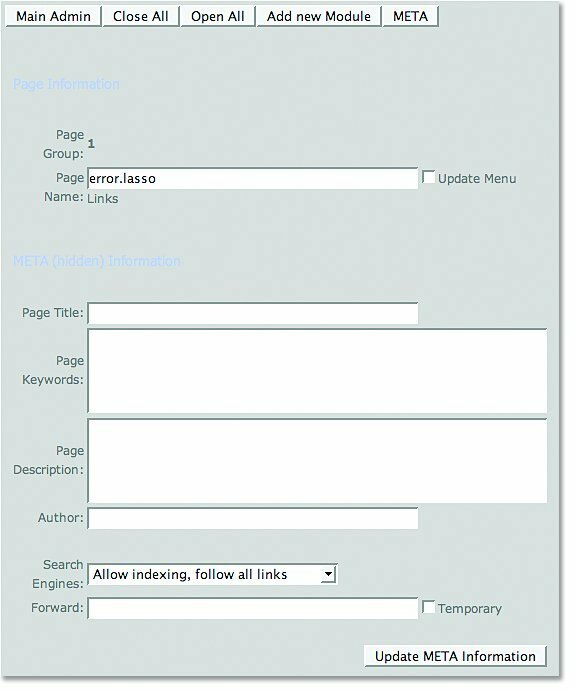 Create a Title for the page, as well as Keywords and a Description relevant to the page’s contents and enter the Author’s information. Select Update META information. The	Security Module allows you to control a variety of security settings for accessing leap™. This includes the Toggle Keyword for leaping in and out, selecting specific IP addresses that are or are not permitted to access the administration section, and setting the number of failed login attempts permitted by a user. In the Main Admin section, select Security. Make	the	changes	required	and	select	Update.